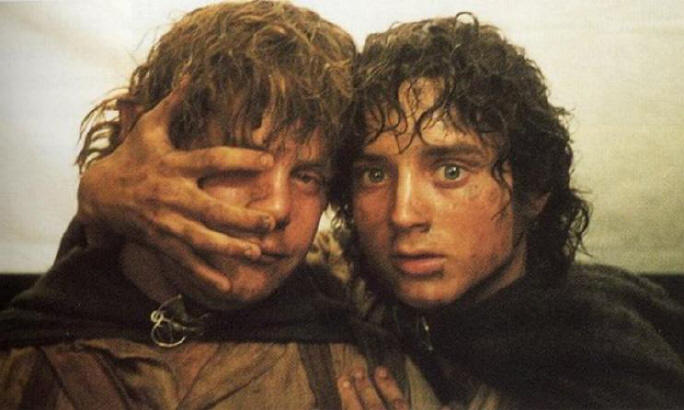 Frodo: "Sam, if I cover your right eye like this, and you peek with your left, maybe you can look at Gollum differently." Sam: "Right, Mr. Frodo. But he is still nothing but a murderous conniving Stinker. No matter how you want me to look at him. Even if it is through your fingers." No, Sam, I still don't think you look like Sylvester Stallone. Frodo applies the Vulcan mind meld on Sam to learn the truth if Sam really did eat all the lembas up. Having stumbled upon a picture of Gollum in that pink dress with the ballerina pumps, Frodo quickly covers Sam's face, saying, "Don't look, Sam! It's not a pretty sight!" Don't look, Sean...but Christopher Tolkien is about to sue us for bringing Sam and Frodo to life on the silver screen! You can pick your friends, you can pick your nose, but you can't pick your friends noses! "Don't look, Sam - that Ted Sandyman is making out with Rosie!"